Father’s day is quickly approaching and Prestige Hampers have a Father’s Day Hamper perfect for the occasion. It can be hard to find a gift for some dads, but Prestige Hampers have many different options. Hampers offer a touch of luxury for the gift recipient and foodies will love the Hamper I received for the Mr! Prestige Hampers have a fantastic selection of gifts and Hampers for all occasions, we previously reviewed a Christmas Hamper that was full of delicious luxury food items too. 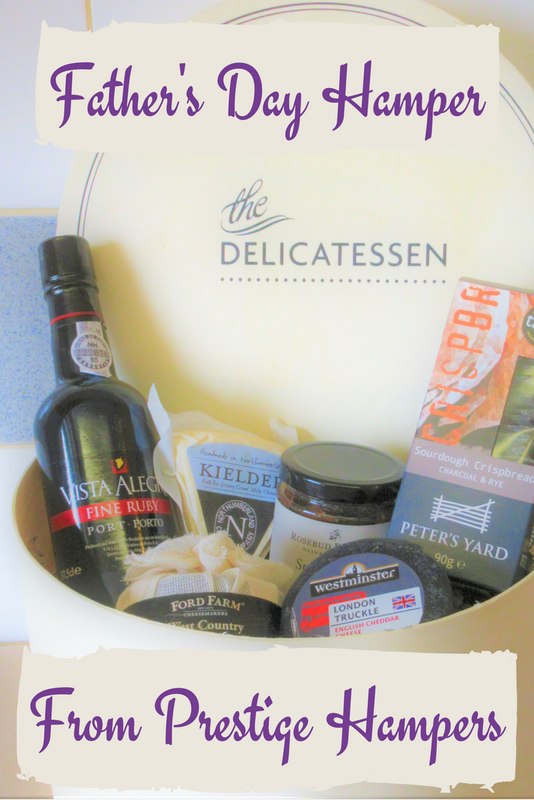 We received The Delicatessen Hamper (£44.99) to review which arrived in a large Delicatessen wooden hat box. 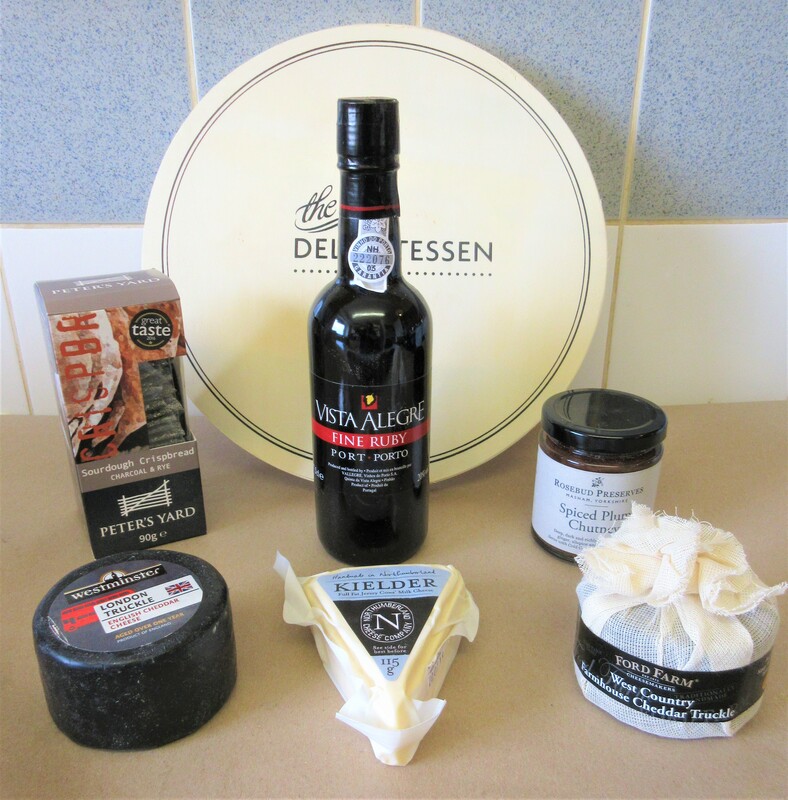 Full of port, fine cheeses, bread and chutney, any foodie dad would love to receive this lovely gift. This lovely hamper is perfect and the cheeses are absolutely divine! Any cheese lover will really appreciate this lovely Father’s Day Hamper. This Father’s Day why not treat dad to a lovely glass of port to enjoy with this delicious collection of cheeses, chutney and crispbread. We tried the West Country Farmhouse Cheddar Truckle Floppy Top to begin with and it was so creamy and full of flavour, perfect with the Sourdough Crispbread. Warning – The Sourdough Crispbread is beyond moreish! You could team this gift up with a lovely cheese board too. You can order gifts from Prestige Hampers across Europe & Internationally although courier rates vary. Next day delivery is available for most products & delivery costs just £5.80 per item. Tracking information is available for all orders. I love that you can select which day you would like your gift to arrive, making ordering in advance even easier! Would your dad or partner enjoy receiving a Father’s Day Hamper like this fantastic Delicatessen Hamper? This looks and sounds fab! Something to consider for my dad - he's not a port fan though.